Why Yemen is the next war front. As an editor here at viewzone I get to write and publish lots of interesting stories. Some authors write stories to promote a book or CD. Others want to be credited with a discovery of something, usually in the field of science or history. Occasionally though, a story must be told because it is ripe -- its time has come -- and that is why I have decided to write this true story about Yemen. In the past couple of days, Yemen has been in the news. Following a botched terror attack by a Nigerian who once visited Yemen, Senator Lieberman and President Obama have told the American public that this country is the next war front. In no time at all there will be military advisors, equipment and soldiers on the ground, just like in Iraq. And like Iraq, the real agenda for being there will be hidden from you. That is, until you read this. Soon you will hear many things about Yemen. The media will paint a picture of this country and its people as the new home of Al Qeada, and you will believe what they say. Why wouldn't you? Yemen is the poorest country in the Arabian peninsula. It's located on the map below Saudi Arabia. Despite it proximity to the rich oil nation, Yemen is too far south to benefit from the rich oil deposits. It's hot and dry and water is scarce. The Yemeni people are mostly tribal, as they have been for centuries. There's really no reason anyone would vacation in Yemen. Unless you have family there, you would likely never go to Yemen. In 2001 I was the guest of the Yemeni government because I had accidentally made a discovery that I had no right to make. I discovered strong evidence that the Ark of the Covenant is buried in an archaeological site in a desert outpost called Marib. I know how it sounds... but keep reading. No, I'm not an archaeologist or even an historian. At the time I was a computer programmer, working in a cubicle for the electrical grid that controls the power for the Northeast of America. In my spare time I was, and still am, the editor for viewzone. I was asked to do a story on some petroglyphs -- carved stones -- in a small Colorado town called LaJunta. The man who asked me was named Bill McGlone and he suspected that these carved shapes were an ancient language from the "old world." The petroglyphs above were originally painted with aluminum powder before being photographed and have been enhanced here in white with photoshop to make them stand out from the dark rock face. I went to the site and photographed the petroglyphs. They were very old and covered with thick black patina, a kind of mineral that builds up on the stone over many centuries. I had to illuminate them from the side to reveal the hollowed shapes and sometimes there were younger Native American petroglyphs scraped on top of them. Aluminum powder, which is mixed with water, was painted on some of the very old and darkened petroglyphs. This falls off the rock harmlessly when it has dried. It's better than chalk, which can scrape and damage the patina and interfere with any attempts to date the writing. The older petroglyphs seemed to have recurring symbols, like an alphabet, and I spent about a week photographing them. When I returned home I published them on viewzone and, at Bill's request, asked if anyone could shed light on what these shapes might mean. About a year passed. I received news that Bill McGlone had passed away. There seemed little interest in the petroglyphs of Colorado until I got an e-mail from a retired professor from BYU. He didn't say much but attached some jpg files showing more petroglyphs with these same shapes [right]. I immediately wrote back to him and asked where in Colorado these photographs were taken. 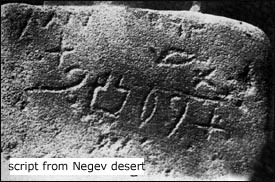 He promptly replied with even more photographs that were from the Negev desert in Israel. 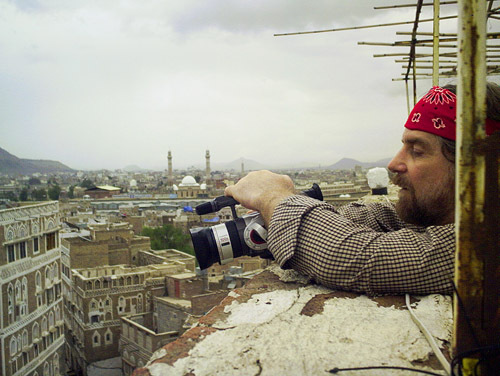 Dr. James Harris made many trips to the mid-east. He was particularly interested in a collapsed turquoise mine containing inscriptions in the same alphabet that were carbon-dated to 1500 BC. It was the same alphabet that was found in Colorado. 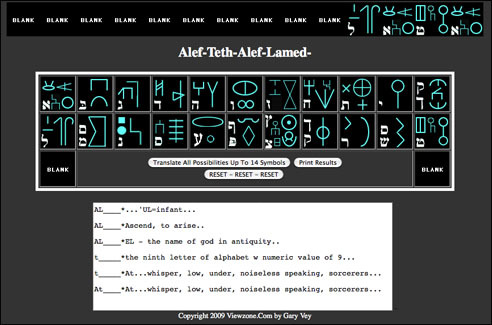 He successfully translated the writing by using an ancient proto-Hebrew dialect. He offered to translate some of the Colorado inscriptions and shared his algorithm with me. The next e-mail I received contained more photographs of the same alphabet. This time the letters were perfectly formed in a font, carefully carved in stone and cast in bronze! The photographs were taken at the newly excavated archaeological site of the Queen of Sheba in Yemen. A team from the University of Calgary had uncovered the Queen's palace after being buried in the desert sands for 3000 years. The photos were from press releases announcing the discovery. 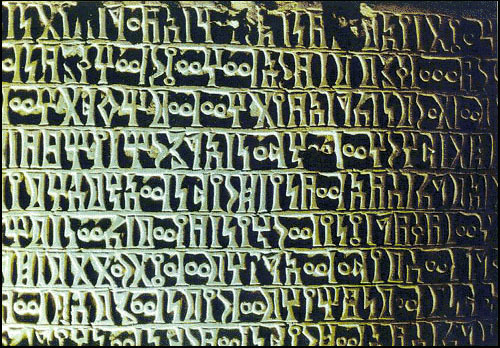 They stated that an "unknown" language had been found on a large wall surrounding the unexcavated courtyard of the Queen's palace. Often workers posed in front of the wall, hiding some of the letters. This was frustrating to me but I managed to translate enough to suggest a story that was written there. I stayed up for days and finally translated what texts I could see from enlarging the photographs. The next photograph was of a bronze cast cylinder that looks as if it had once enclosed a round column. The individual letters of the alphabet had been mass produced, perhaps in wax, before the bronze was cast. "Movable type," I thought. How ingenious! I spent another long night translating this text and it seemed somehow relevant to the carved stone I had finished the previous nights. The photos were being sent to me by John McGovern, who lived in Australia. 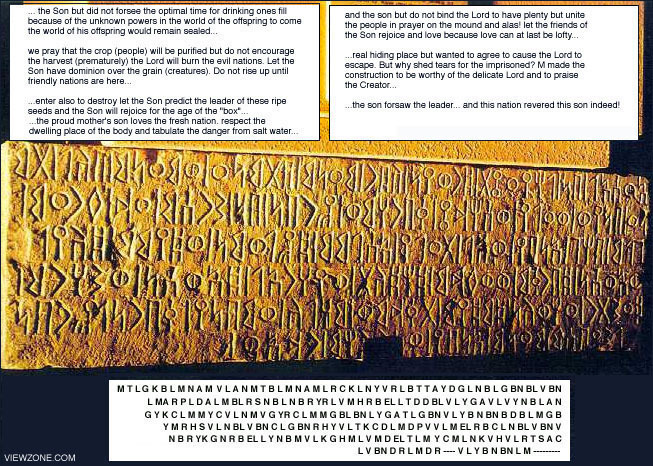 He was following the discovery of the petroglyphs in Colorado and saw the similarity of alphabets in the press release by the University of Calgary. He continued to research the artifacts in Yemen and sent me one more carved stone that was on display in a Yemeni museum -- upside down! I rotated the image using Photoshop and began translating again. ... the son foresaw the leader ... (part of block missing here) ... and the nation revered this son indeed!" Because I am not an academic, getting anyone to review my work was almost impossible. No one would even speak to me and, if they did, they would mention Graham Hancock or even worse -- the movie, Raiders of the Lost Ark. But eventually, someone did listen to me. I sent a copy of my translations to the office of President Saleh, in Yemen, and received an invitation to come to the archaeological site.